A generous quantity of Ajwain gives a distinct flavor to this quick preparation. Add ½ cup of water, cover and cook on low heat until the chicken turns tender. Add cream and chopped cilantro. Continue frying this until chicken is dry and well coated. Serve hot. Depending on the kind of chicken, the cooking time can vary. You can omit water in step 5 altogether if the kind of chicken you have cooks easily. 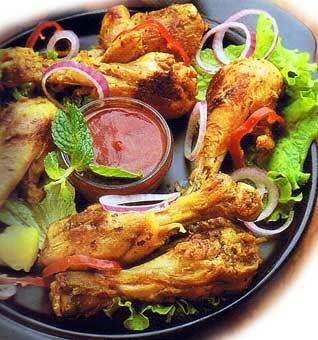 Using thigh and drumstick will not make the meat hard when overcooked. Can we use ajwain powder instead of seeds and wht quantity it shuld be used. Mr chef i would like to know what are the rest of the marinades added in chicken in step 4 when the chicken is already marinated in all the ingredients mentioned in the recipe? Mindblowing. This recipe has made me from an Average cook to an Excellent cook I will definitely try your other recipes. Thank You. its yummy.despite of using ajwain.its taste superb.